Listen up Scrabblers... you finally have something to brag about besides knowing what MUZJIK is, and if you think it's elevator music, put those tiles back in the bag and pack up your Scrabble board because this doesn't apply to you. 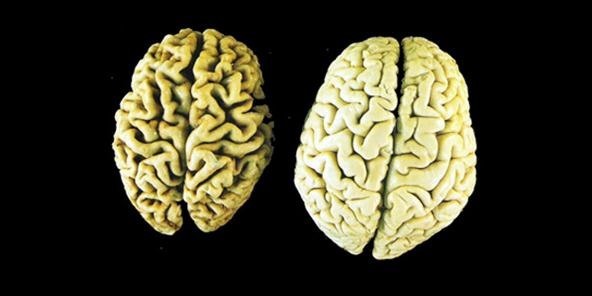 You see those brains below? Well, guess which one is yours. If you chose the one on the right—the big one—then you're just as cocky a Scrabble player as I am. But that's okay, because you're correct. Playing a word game like Scrabble increases your brain size. Okay, it doesn't exactly 'increase' your brain size, but being a competitive Scrabble player does make you smarter. 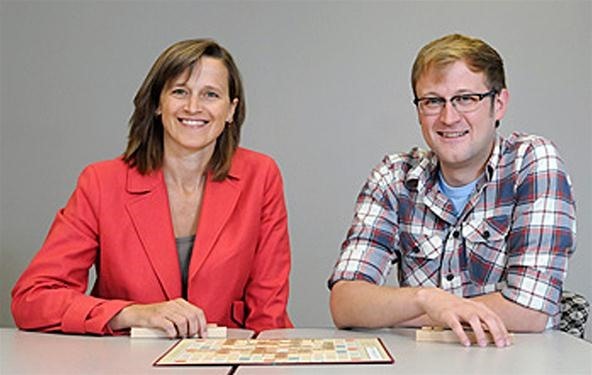 Researchers at the University of Calgary in Canada tested dozens of competitive Scrabble players to analyze how they recognized words, then compared the findings with age-matched casual Scrabblers, as well as undergraduate students, because they are the standard sample for word recognition studies. The results showed that Scrabble addicts who know words like MUZJIK can identify actual words over racks of complete nonsense about 20 percent faster. Because unlike most people, competitive Scrabble players don't necessarily need to know the meaning of words to distinguish them as real or fake. So, I guess you don't need to know what MUZJIK really means. If you think it's elevator music, then it's all good because it doesn't matter, as long as you know it's in the dictionary. However, MUZAK is not in the Scrabble dictionary, since it's a proper noun. "They were able to sort of de-emphasize the contribution of meanings. They didn't need to rely on it as much. They could just make the decision based on sight alone," says Ian Hargreaves, PhD candidate in Psychology and the lead researcher on the study. "Scrabble players have honed their ability to recognize words such that they have actually changed the process of reading words." It shows for the first time that it's possible to develop visual word recognition ability in adulthood, beyond what researchers previously thought was achievable. "The average literate adult relies on three components to process and read a word: sound, spelling and meaning," says Penny Pexman, professor of Psychology. 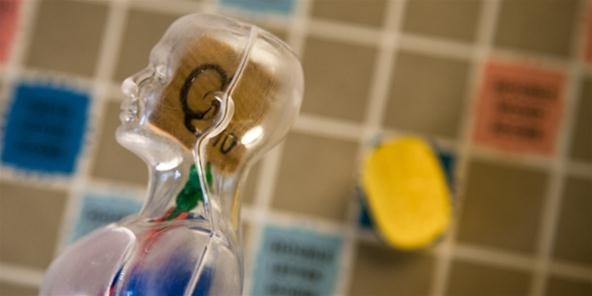 "When we studied the Scrabble players, we found that there is significant flexibility in the tools they use to read words and that it can include the orientation of the word as well." It probably helps that Scrabble addicts tend to devote tons of time to studying the 180,000 words listed in the Official Tournament and Club Word List, making it easier for them to solve anagrams. The study also showed that competitive Scrabblers can recognize real words vertically just as fast as they could horizontally, while their non-player counterparts showed significant loss in speed when reading vertically. "The behavior of these visual word recognition experts highlights the experience-driven nature of visual word recognition and pushes the bounds on what we previously considered the endpoint of development of the word recognition system." So, maybe it's time you started studying some word lists or at least the Scrabble dictionary. You know, after playing with Scrabble on my Kindle, I think I have gotten smarter!